George has been in the Auto Repair, Service business full time since 1999. He has been working here with his father since 1984 part time. George and Sam decided to start the Auto sales business to complement the Auto Service and Repair. We have two main focus points Safe, Reliable cars for the new driver and a car to get your college student to and from school for the next four years or more. Another area of focus is a personal auto shopper for you. We will find you the year, make, model, and color etc. George was born in Philadelphia and stayed there till we moved at the age of five to Bucks County Pa, where I went to school in the Council Rock School district and Graduated from Council Rock High School in 1988 and started his own business. While in business he want to Bucks County Community College for his associates in Small Business Management. 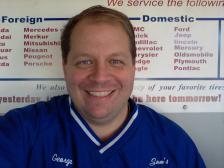 George ran his own successful business till 1999 when he took over Sam’s Auto Service on September 9th 1999. George has been married since 2000 has four children three daughters and a stepson.